The unthinkable has occurred, and a miracle also happened – a week and a half before Christmas, with the police seemingly out of the loop, shooting between two rival gangs erupted in the BTL Northside Park on Newtown Barracks during a concert, the Christmas Park Fest, at about 11:45 p.m. on Saturday, December 15, and while the bullets were flying, in attendance were almost a thousand people, including men, women and children. Mercifully, according to police, only one person was shot, and no one was killed, although six people were subsequently stabbed during the revelers’ frantic attempt to escape the terror and the shooting. The area of the park, for revenue collection of $5 per person, had been blocked off on the south by the Ex-Servicemen’s League almost opposite Princess Hotel, and on the north by MJ Grand, almost opposite Marina Towers. 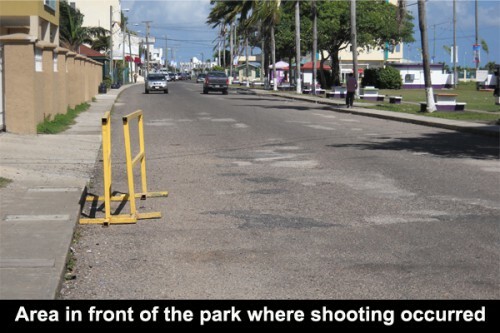 In the clash that erupted between the two Belize City gangs, during which there were three shootings at the park, Gregory Jones, 21, of Bocotora Street, was shot in the left side of the neck; Tulio Caceres, 28, of Taylor’s Alley, was stabbed in the right side of the abdomen and cut on the right hand; David Cabral,16, also of Taylor’s Alley, was stabbed in the left side of the abdomen; Kareem Smith, 16, also of Taylor’s Alley, was stabbed in the left side of the back and in the right side of the abdomen; and Dillon Diamond, also of Taylor’s Alley, was stabbed twice in the left side of the back. They were all rushed to the Karl Heusner Memorial Hospital, and are now recovering in ward. Reports are that people started to scatter for cover, and the men were stabbed during the confusion. Police are seeking a person who they believed fired the shots at BTL Park. The mayhem began when a group of men entered the park, and shortly after, another rival group entered. There was a confrontation, and bottles were thrown at each other. Our sources inform that the confrontation featured the George Street gang on the one hand, and the Pregnant Alley gang on the other. As is often the case, a group of men ran out of the park, and shortly after they returned with guns. Three different salvos were fired. A witness told Amandala that she and five of her friends ran for cover under a car that was parked in front of the MJ Grand on Newtown Barracks when they saw a man with a gun in his hand chasing another man, and firing at him. About an hour later, police came and told them that it was safe to come out. The witness said there was mass confusion and panic. However, the gates were not opened, and the panicked crowd ran towards the Princess Hotel, which also locked its gates. The security officer said that there was only one policeman near them working for the Park Fest, and a group of men crowded him and tried to take away his gun. His police colleagues came to his aid, but by that time, the people had sought shelter elsewhere. At the weekly police press conference this morning, Monday, it was announced that no one has been detained or arrested, but that the police were looking for the person who had started the shooting, believed to have been over a stolen chain. As at press time tonight, no arrest or detention has yet been reported.